Both TreeHugger and EcoRazzi wrote that “nurse sharks are known for eating algae from time to time”. This is, at best, an incomplete statement. There is no evidence of any shark preferentially eating algae or any kind of plants in the wild. While nurse sharks primarily eat fish and crustaceans, bits of coral with algae growing on them have been found in a few nurse shark stomachs. They most likely ingest this accidentally when they eat fish or crustaceans sitting on the coral. Similarly, bonnethead sharks have been found with seagrass in their stomachs, most likely as a result of capturing crabs sitting in the seagrass. Even I accidentally ingest a small piece of lettuce or tomato every once in a while when I fail to pick all of it off of my sandwich, but to go from this to claiming that I eat lettuce and tomato from time to time is a stretch. It remains unclear why this shark reacted in this particular way. TreeHugger claimed that being caught by a fisherman “seems to have left a lasting impression on her — namely, that meaty treats mean trouble,” but this doesn’t really make any sense. If every shark that was caught with a baited hook was repulsed by the smell of fish for the rest of its life, we probably would have seen this behavior before now in one of the countless other captive sharks that were caught by baited hooks. The stress of captivity alone can be traumatic enough to induce radical and unhealthy changes in the behavior of species like horses, primates, bears, and elephants. Unnatural repetitive behaviors associated with captivity, known as “stereotypies”, include walking or swimming in circles, biting the bars of the enclosure, or intense self-grooming that can even result in injury. It’s extremely unlikely that captivity stress caused the changes to this shark’s preferred diet, as nurse sharks are common aquarium residents and this behavior has never been documented before. The stress associated with a serious injury and associated major surgery may well have been enough to do it. We may never know the reason why this nurse shark is behaving like this. What we do know is that when an animal suffers a traumatic experience and then radically changes its diet and behavior in an unhealthy way, it isn’t something that we should celebrate. If animal rights/welfare-oriented media had picked up on the “trauma of capture and captivity makes animals do unhealthy things” side of this, they could have actually made a salient point with the story. Wow, this is really sad. Poor shark. Maybe it’s some kind of innate digestive remedy, like when normally carnivorous animals eat grass, leaves, or other non-nutrient items in order to produce a certain effect. Don’t dogs and cats do that to help clean out their digestive system? And I know for certain that chimps will eat the rolled up leaves of a certain plant in order to knock back intestinal parasites. Maybe the hook, or the removal, has done some kind of nerve damage or tissue damage to initiate this behavior? Wish I knew more about sharks. 🙂 Thank you for posting this article. As a vegan, I want what is best for all animals. This is so freakin’ clearly NOT what is best for an animal who has evolved as an absolute, obligate carnivore for eons. This is disgusting. This poor shark needs to be either retruedn to the sea, or, if too sick for that, immediately taken to a reputable large research and rehab center for care. I’m sickened. Anyone who thinks this is some kind of boon for the vegetarian cause is an idiot. It’s comments like these that make me wish I could click the thumbs up twice. KK, like the Southern Fried Scientist I love most of your comment, but I should point out that this diet has been the case for at least a couple of years and that the shark is in a large aquarium facility with rehab capability. It is being as well taken care of as possible for a shark with a previously unidentified behavioral anomaly. I don’t think being returned to the wild would help. 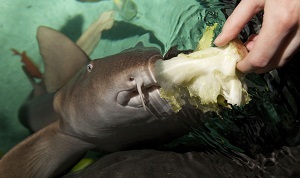 I want to know why this shark was offered veggies in the first place……. I believe that the shark originally took veggies that had been offered to the tank’s resident sea turtle. Great read as always… & love the sandwich comparison. Brings a visual aspect, very creative! I don’t really have any other comments (For once!!) .. Educational & funny, great job. The hook was in the sharks mouth not in it’s digestive system. This is how they catch them for the aquarium trade…by fishing! This shark should have never been in captivity to begin with. Let it go! It will be fine if it does not have stupid humans around to feed it lettuce. Why are “experts” so stupid?